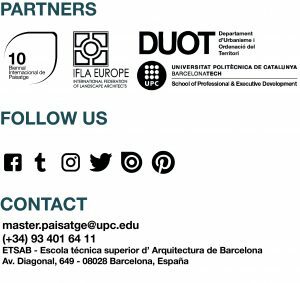 TOURISM: NEW USES FOR OLD TERRITORIES – Master in Landscape Architecture Barcelona – Universitat Politècnica de Catalunya – 35ª EDITION. The studio deals with tourism due to its growing importance as an economic sector and to its inevitable relationship to landscape. There is no tourism, by definition, without an associated, existing or invented landscape. Tourism as a mass activity, especially the one related to seaside developments, has often been related to speculation and exploitation of natural resources; recent awareness on sustainable management as well as, the emerging sensibility towards landscape, erodes, progressively, topics on tourism, underlying the necessity to invent alternative management strategies for the landscape, by using tourism as a vehicle for the re-evaluation of deteriorated environments. The studio develops three different work and research lines that develop in parallel: knowledge on tourism as a complex phenomenon of land development and a service industry through lectures by experts, a systematic study of landscape using both conventional methods of landscape analysis and new ones, appropriate for generating new cartographies using Geographic Information Systems and, finally, explore under the prism of design new planning and management instruments, rehearsing with alternative issues and innovative tourist offer. A critical revision of aspects of landscape planning is proposed through a multi-scale approach; finally, the study of the image of tourist areas is pursued from the point of view of landscape ecology, cultural geography, theories of landscape and perception. Related theoretical subjects: Landscape Theory, Landscape Construction, Ecology, Law and Landscape Management, Economics. The workshop takes place in a hybrid territory where improvement strategy through tourism is implemented. The proposed approach to the site is framed by the binomial preposition of the second coast. – Analyze Tourism as a complex phenomenon that occupies and affects landscape. – Assess specific territories where Tourism plays a leading role and compare different solutions that regenerate degraded landscapes while boost the tourist phenomenon. – Draft and design regeneration plans for landscapes suffering from mass tourism and resources overexploitation. – Analyze tourism as a complex phenomenon and source of new resources. Moreover, understanding Landscape as Tourism’s main attraction and main sufferer of specific misguided structures. – Master traditional and contemporary analysis tools (dynamic cartographies and representations, GIS, etc.). – Create and develop new ideals to restore damaged tourist landscapes. The discussion about landscape goes around values not easily measurable. Landscape derives from culture, and it is there where the peasant sees his fields that something else can be discovered. Something that misses the productive eyes of the peasant over his agricultural fields. Ecology has played its role over this discussion, the introduction of technical criteria has allowed us to quantify and evaluate some conditions. Even then, landscape continues to be an intangible difficult to estimate. In general terms, there has been just one activity, tourism, that has made profitable the value of landscape. Landscape is the starting point and the reason of being for sun and beach tourism. Society has been attracted by the “wild nature” to spend their leisure time over his shore. In recent times, younger children used to inherit the unproductive coastline with its beaches, rocks and marshlands, and on the hilltops, prairies were communal fields. All of this, allowed nature to take refuge. Now, tourism has made out of these places, the main argument of its purposes. (…) Mass tourism is one of the characteristics of consumption societies and it is one of the engines developing countries use for activating their economy. Tourism has become a strategy, taken out by governments, to activate and recover economically depressed areas. Architecture’s (buildings, urbanism and landscape) role to configure the existing space has been very important, but somewhat unreflective regarding what, where, and how should the tourist space be made. The majority of these areas are juxtaposed buildings, confined over the territory without a project, a sum of operations to exploit the opportunities and liberties of a given landscape. The proposal of this workshop is to visit a place where a tourist development has been built without a touristic master plan. It is meant for studying its problems and confront a possible regeneration with new tools, tools brought from a landscape discussion. A proposal with two perspectives, inside out and outside in, the perspectives mingle and from their backdrops, a hypothetical second coast is put on perspective.